Danish Army Specific: DAF VT 1600 shown as tractor truck used by the former 6th Danish Signal Battalion. The battalion had a total of 3 semi-trailers. 2 were delivered in the late 1950/early 1960´s. A third was delivered in the mid 1970´s along with the DAF trucks, which superseded a pair of Ford F500 Custom. As the DAF´s were not quite up to the job, they were superseded by Mercedes LA1313 tractors around 1981. 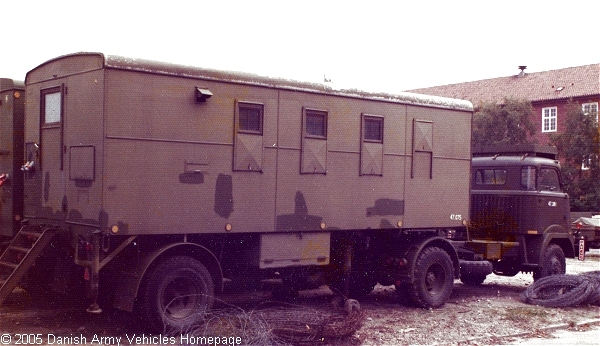 The semi-trailer was used in a teletype platoon for preparing, transmitting and handling messages. Historical: The 1600-series dates back to the 1950´s. Both 7- and 8 ton versions were available. Besides cargo- and tractor-trucks a tipper could be delivered. Also available with 4-wheel drive. Engine: Own 6-cylinder, 5.750 cm3 (351 cubic inches).